What do you do when you are away from your computer but want to see some good, entertaining videos? Erm... tough one. There's nothing much you can do about it but that's only at first glance. Because YoutubeGet V3 is here and you are instructed to have no fear. As long as you do what you are told nothing will go wrong and everything will be well. Actually, on a personal note, I noticed the surprisingly high number of movies that have the line "All will be well." in the script. But this is where I was hinting at, a hostage situation so bear with me. The development team of the downloading tool has a list of demands that you are supposed to meet and follow throughout the entire process. 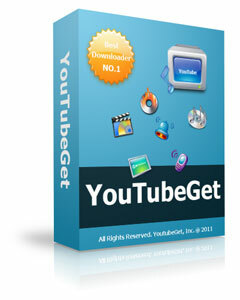 Step 1: the free download of the software: "YoutubeGet is a small application designed to make quick and easy work to download Youtube videos and convert them. Offering a multitude of methods to acquire the video, this application has all the power you need while still remaining small and easy to use. After downloading videos it will auto convert FLV files to MP4, 3GP, AVI, WMV, MOV etc. Soon, you can see YouTube videos on your MP4 or mobile phone!" Step 2: installing the software and then running it for the first time. The process of installing it is easy and requires next to no technical knowledge, the traditional "next-next-next-finish" way of going about it will suffice. (There might be some more "next" clicking required, I didn't really count. My bad!) The first run is as easy as pie, just double-click the icon created on the desktop. Step 4: finding the favorite YouTube videos. Visit the video sharing site's homepage and drag the respective URLs onto the YoutubeGet Drag Zone. A Task-Add window jumps out and the URL will have been auto-filed in the Task URL Box. Congratulations! It'll not take long now. Step 5: Selecting the file type for the video converting, which can be done both before and after the download. The available formats are FLV, AVI, WMV, MOV, MP4 or 3GP. The latter is for the Mobile Phones. Step 6: Download. It's easy, it does it by itself and it makes a "ding" sound when it's finished while popping up a window where the converted file is. Step 7: Copy the file wherever it is you wanted it in the first place.